This volcano glossary includes photos and videos to help you understand the volcanology terms I'm using in my Volcanoes Are Hot Stuff! series on volcano news, history and amazing videos. The stickiness of lava -- its viscosity -- affects the shape of volcanoes and the way they erupt. Sticky, cookie-dough-like lava tends to move slowly, pile up higher, plug up volcanic plumbing, and let go in violent explosions. Runny, low-viscosity lava flows out like wax from a soft candle, spreading out in a puddle and venting off gas so it doesn't explode. Stratovolcanoes, also called composite volcanoes, form rugged, steep mountains. They consist of layers of rocky debris, ash, pyroclastic flows, and pipe-like "sills" and "dikes" of solidified magma that provide a skeleton. The lava from these volcanoes is mostly andesite, which is cooler and more brittle than basalt (see below). 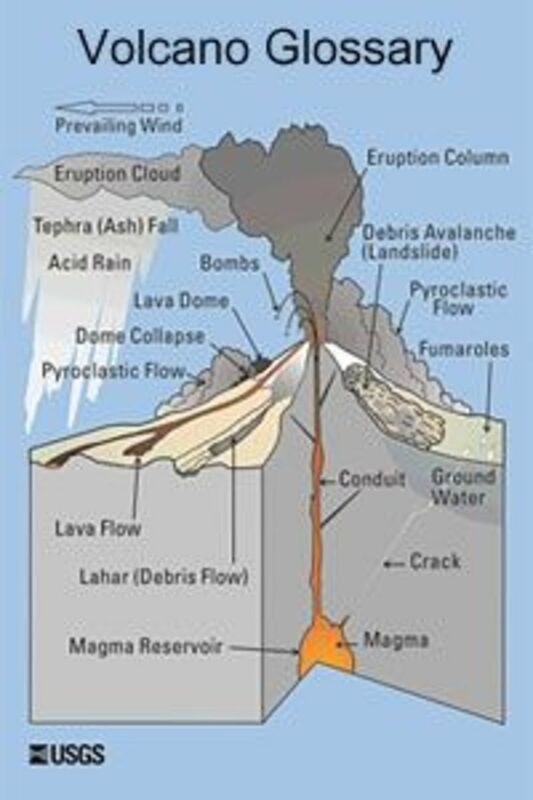 The plumbing of stratovolcanoes may be blocked by "lava plugs" under which the pressure builds, then explodes! Shield volcanoes are flatter and much broader, created by thousands of runny lava flows that spill from a central caldera, or out of cracks in the volcano's flanks. Lava from shield volcanoes tends to be basalt, a very fluid lava. It can create self-insulating, glassy-walled "lava tubes" and travel for miles. Cinder cones sometimes grow on side vents of other volcanoes; other times they sprout on their own. They are steep hill-sized cones around a single vent. They toss up congealed lava in ribbons and cinders (gravel-sized chunks). If the gas pressure subsides, lava flows may ooze out through the base. Cinder cones sometimes change to shield volcanoes. Lava domes are piles of highly-viscous lava that slowly squeeze out like dried-up toothpaste. Inside, they may be molten. 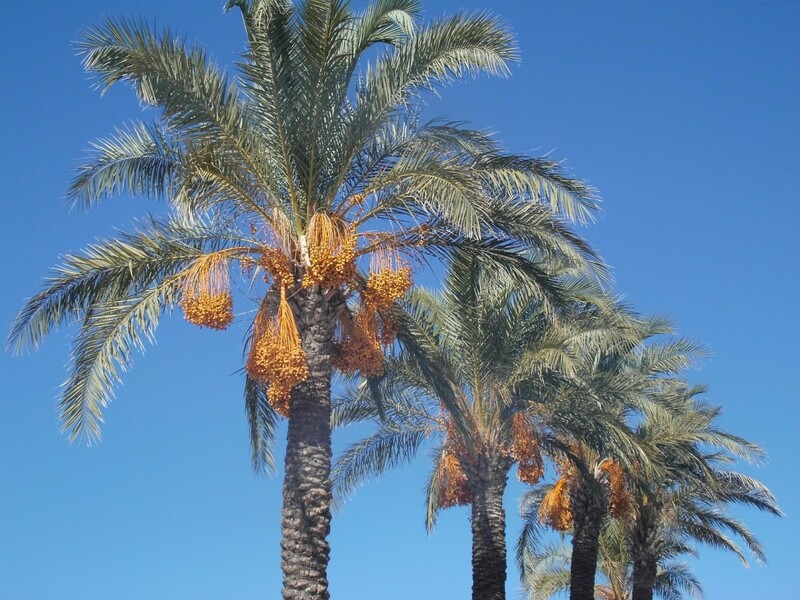 They are brittle and unstable, and often explode or collapse in pyroclastic flows. Since Mount St. Helens blew its top in 1980, many lava domes have formed and collapsed in the large crater left by that eruption. Calderas are collapsed areas over drained magma chambers, often circular. 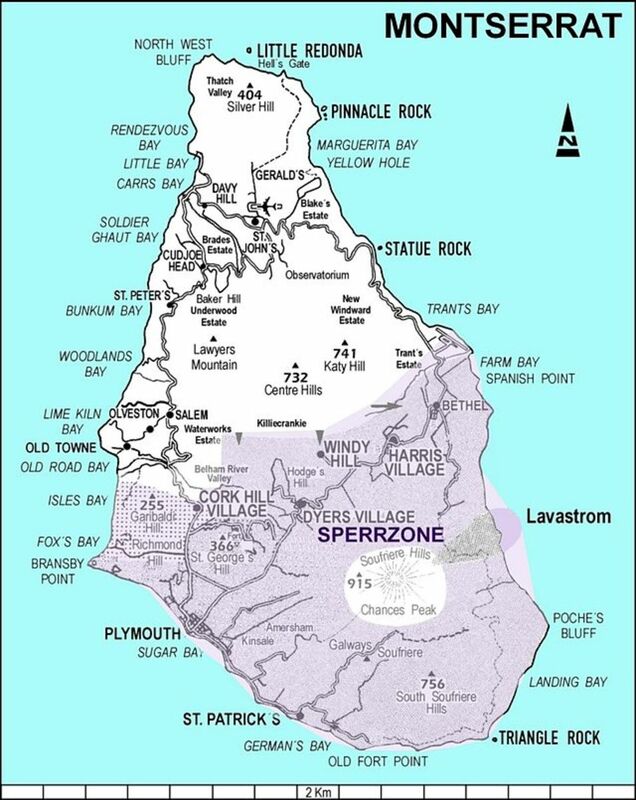 Shield volcanoes' shallow calderas sometimes refill with a lava lake when the magma returns. Stratovolcano calderas may develop lava domes, stiff rocky plugs that slowly swell as new lava pushes up from below. Old calderas may collect water, forming lakes that may be heated, highly acidic or full of sulfur from rising gases. Rhyolite caldera complexes are the scars left by huge, ancient eruptions. They build up massive amounts of pressure and explode violently, leaving behind a vast collapsed area over gigantic magma chambers. There are often multiple caldera scars, ordinary-sized stratovolcanoes, and lava domes in these complexes. Geologists have discovered deep layers of ash and flows spreading out from them for thousands of miles. Luckily, the last such eruption was in 83 AD. Unluckily, Yellowstone is one of these monsters. Lake Toba, Sumatra, False-Color NASA Satellite Photo. 100km long, 30km wide, Lake Toba is the ancient rhyolite caldera left over from a 73,000 year old cataclysmic eruption. (Read more about it). The island in the middle of Lake Toba is a lava dome that has uplifted over a remnant of magma in the ancient magma chamber. While shield volcanoes can sometimes get blocked up and explode, these three kinds of volcanic debris are more typical of stratovolcanoes. See the videos following this section for examples. Pyroclastic flows are extremely dangerous. These swift-moving avalanches of superheated ash, cinders, and boulders can race downhill at up to 100km an hour, easily overtaking anyone trying to outrun them -- even in a car. A hot, heavy cloud of ash and gases rolls above and races ahead of the flow. Temperatures inside range from 200 to 700 degrees C, cooking anything inside. At night they sometimes glow red, whence the name "glowing clouds" (nuée ardente in French). lahar (Indonesian word) is a volcanic mudflow made of ash and water, often following river valleys. They are a common hazard with snow-capped or glacier-capped volcanoes. These walls of boiling hot mud have the consistency of concrete and can move at the speed of a freight train, overflowing riverbanks and sweeping away roads and towns. They look like flowing water, but are much heavier. See the videos below. The first two videos show pyroclastic flows; the second two are lahars; the last is ash. Here's a few more terms for different types of eruptions that you'll often see in the news or on volcano websites. Strombolian eruptions, named after a volcano in Sicily, look like a giant sputtering blowtorch. They shoot out a burst of lava blobs with a loud noise, die down, and then go "foosh" again after a few seconds or minutes. Large gas bubbles in the volcano's plumbing cause the characteristic pistoning action. These aren't very dangerous, since the lava lands around the cone, not miles away. Many Mt. Etna videos show Strombolian eruptions. Plinian Eruptions are monster explosions sending a massive column of ash that can reach up to 35 miles. It often spreads out as it reaches different layers of air ("like an umbrella tree", Pliny Junior said, describing Vesuvius in 79 AD). Mount St. Helens in 1980, Pinatubo, Mt. Redoubt, and the ongoing Eyjafjallajökull eruptions in Iceland that keep spewing ash all over Europe. "Plinian" describes the titanic mushroom-shaped column of ash; these eruptions may also have pyroclastic flows, lahars, or lava flows. Pahoehoe (Pah-HO-ee-HO-ee) is fast-moving, runny lava. Its leading edge flows forward in lobes or "toes" like puddling wax. Often, the surface of a pahoehoe flow will solidify, creating a naturally insulated pipe that can carry lava for miles. If all the lava flows out of a tube, it may leave behind a large round tunnel! "Pahoehoe means smooth, unbroken or satin like. The "Aa" lava is the stony, rough lava. The joke about the sound you make when walking on it barefoot was created for the tourist. The spelling "a'a" has too many meanings to be listed here, but all of the various definitions are dependent upon the context in which the word is used, but none of them being lava. The closest would be to burn; glowing; fire; staring, as eyes (a'a maka) or the throat is on fire with thirst (Ua `a'a ka pu'u )." Video: A'a and Pahoehoe - Can You Tell Which Is Which? Lava Bombs are large blobs of smooth, basaltic (glassy) lava which cool and solidify as they fly through the air. Lava bombs come in many different shapes, from ribbons to spindles to "cow pats". Some are as big as boulders! Despite their name, they don't usually explode when they hit the ground; they're more like "lava cannon balls." Scoria, or volcanic cinders, are what most people think of when they say "lava rock." It's basaltic, meaning it was formed by fairly liquid lava, and contains lots of bubbles. Ranging from black to red to white, it's commonly used in garden landscaping. Here's a beach pebble of scoria I found on the volcanic island of Thera. Fresh scoria is craggy and irregularly shaped; this piece has been rounded by the ocean. Pele's Hair is long strands of glass formed when lava fountains or spatters get caught in the wind. It's named after Hawai'i's volcano goddess. These strands have gotten a coating of sulfur. I've seen it even finer than this, blowing and catching in the crevices of old lava flows on Killauea. Check out this great photo of Pele's hair coating the landscape. Pumice is essentially solidified lava foam. Very frothy lava, full of gas bubbles, turns into a soft rock riddled with holes like a sponge. Like the hard foam used to make Boogie Boards, there's so many air (or gas) pockets in pumice that it can sometimes float. In 1883, sailors reported seeing huge rafts of pumice floating in the Indian Ocean. At right, I've floated a piece of pumice from Thera in a flower vase. See my Youtube video, Pumice: The Rock That Floats or my Why Do Things Float? page for more info. NOTE: Technically, "Lava" only refers to volcanic rock coming out of a volcano while it's still molten. After it cools, it is called "igneous" rock from IGNIS, the Latin word for fire. Among other things, this photo gallery shows: several stratovolcanoes, a Vulcanian eruption, a few Plinian eruptions, two stills of Strombolian eruptions, at least one cinder cone, a lava tube with a "skylight" (a hole in the top), several calderas, and solidified pahoehoe. Did I miss a volcano term you're curious about? See the USGS Volcanoes Photo Glossary for answers to all your burning questions. Guestbook for Students of Volcanology - Got Any Questions About Volcanoes? Excellent idea for a lens, and put together very well! Very good lens and on one of my favorite topics. 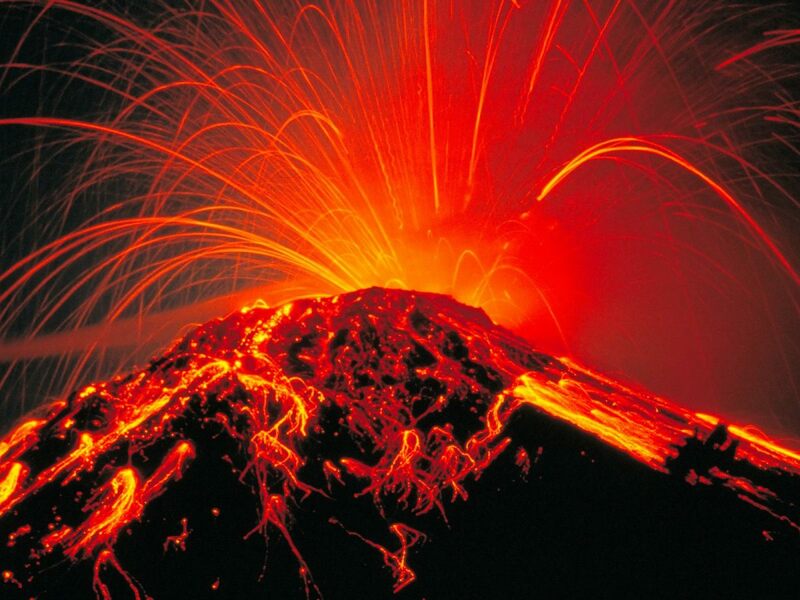 I'm passionate about volcanoes, their inner life, "temperament" and hidden power!